Epithelial–mesenchymal transition (EMT) plays an important role in cancer metastasis. During EMT, tumor cells acquire the capacity to migrate and invade the stroma. Activation of the transforming growth factor-b (TGF-b) signaling pathway is of major importance for the initiation of EMT. Smad4, an essential protein of this pathway, is known to complex with multiple transcription factors (e.g. Snail-1, Slug, Twist-1), in various types of cancer, promoting the repression or activation of target genes. The role of Smad4 in colorectal cancer (CRC) is not straightforward so far. 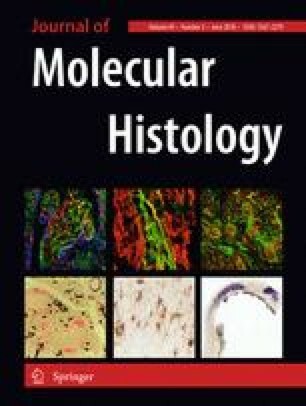 In the present study forty eight resected CRC tumor specimens were immunohistochemically examined in order to assess the expression of Smad4 and its association with E-cadherin, Snail-1, Slug, Twist-1 protein expression and with various pathological parameters. Smad4 was found to be positively correlated with Snail-1, Slug and Twist-1 expression (p < 0.001). On the other hand it was negatively correlated with the expression of E-cadherin (p < 0.001). Furthermore, lymphatic invasion could be clearly associated with Smad4 expression, a finding complying with the metastatic ability of EMT cells. In conclusion, Smad4 could be considered as a central component of EMT transition in human colorectal cancer that combines with transcriptional factors to reduce E-cadherin and alter the expression of the epithelial phenotype.